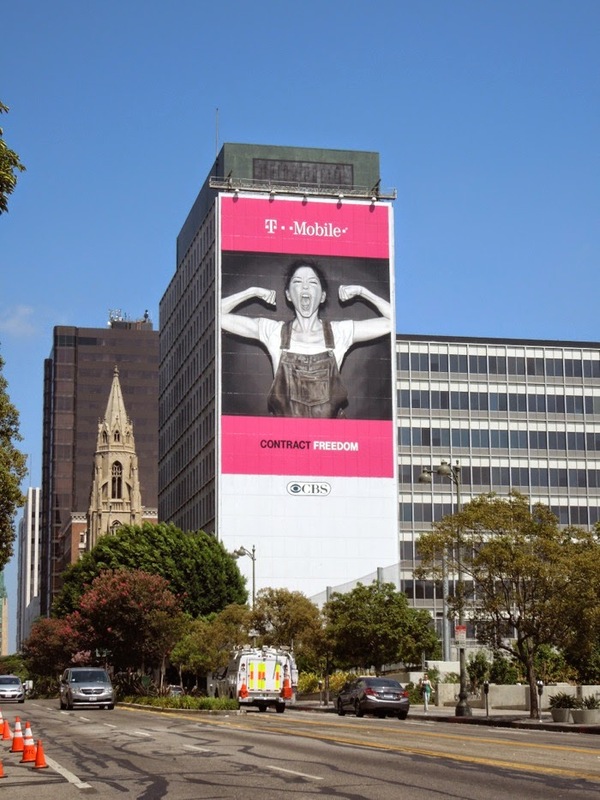 Looks like T-Mobile wants to start a revolution with these giant-sized 'Contract Freedom' billboards in L.A. 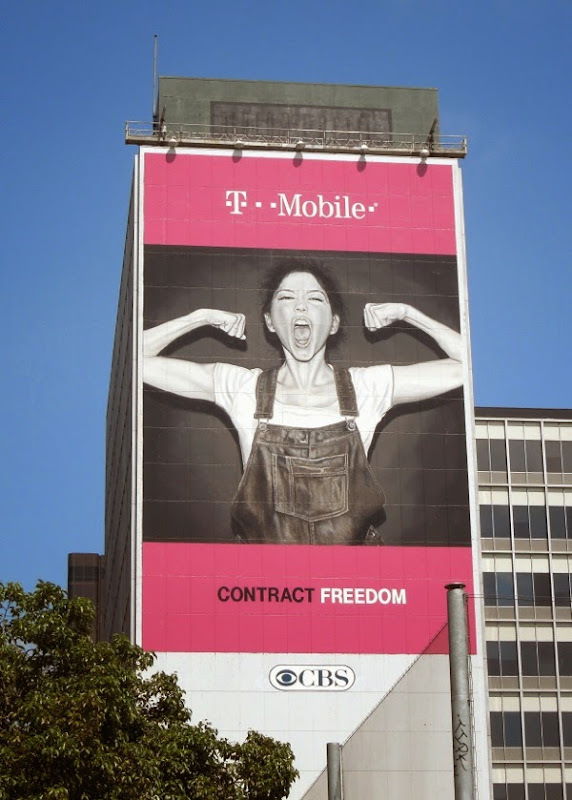 These towering creatives designed to communicate the contract free offering from the mobile phone service provider almost evoke those wartime propaganda posters, similar to this Bomb Girls TV show homage. 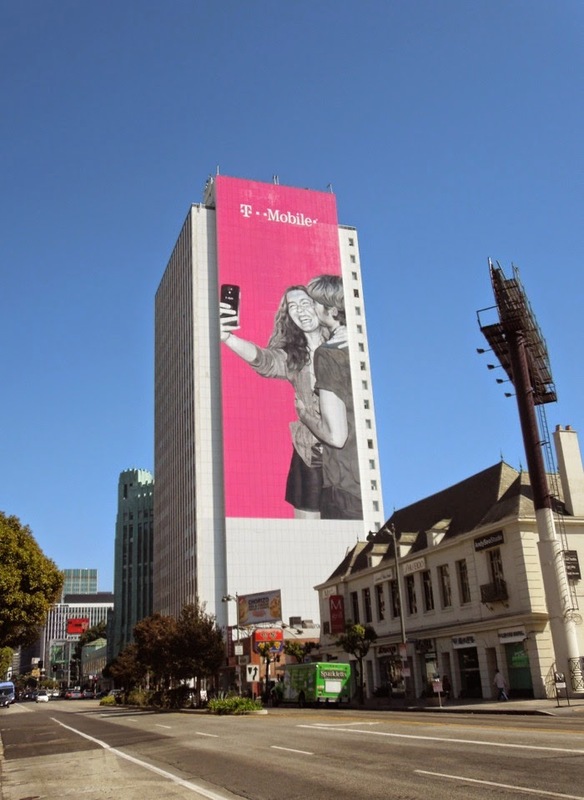 Funny enough, as they feature female models, they also evoke those the empowered spirit of this roller-skating tampon ad commercials of the 90's. 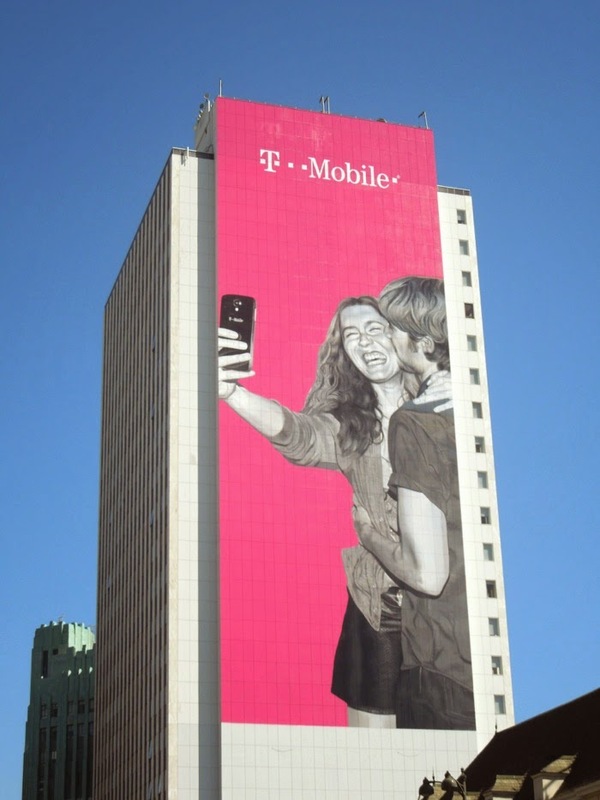 Yes, you too can have a mobile phone without an annual contract and be truly free all the time. These super-sized wallscapes were both snapped eastbound along Wilshire Boulevard in Koreatown on July 15, 2014, the ad creative with one arm punching the air one at Manhattan Place and the other with the woman flexing her muscles was spotted further east above the Robert F. Kennedy Inspiration Park. 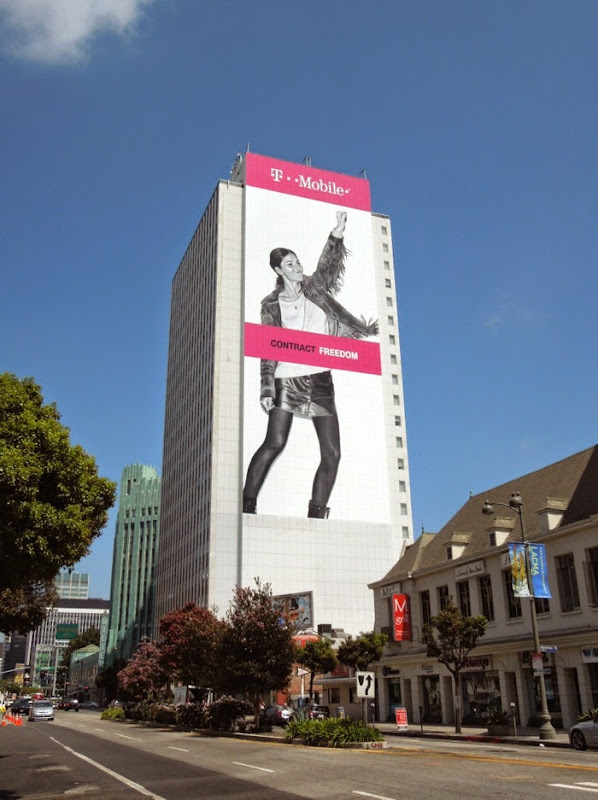 In addition to releasing people from silly contracts, T-Mobile is also obliterating data-roaming charges in 120+ countries (one of Daily Billboard's pet peeves), so that when people travel the world they're not penalized for crossing a border and suddenly losing the use of their phone without paying excessive charges. 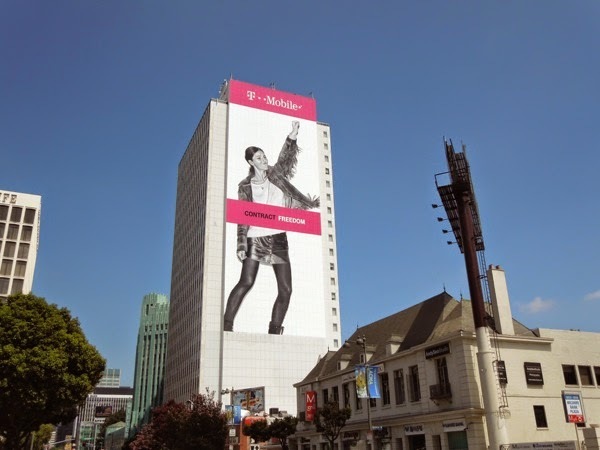 UPDATED: Here's another fun super-sized creative from T-Mobile which should appeal to the youthful selfie generation. 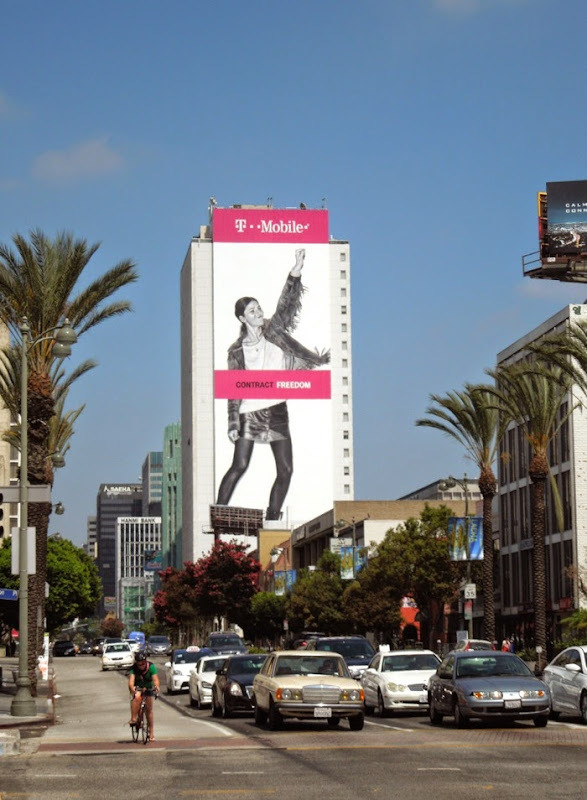 This giant billboard, which you can't help but notice from a distance with its hot pink hue, was snapped in the same Koreatown ad location along Wilshire Boulevard on October 1, 2014.